MORE (Modular Organic Regenerative Environments) is asking for used athletic shoes to fight poverty, hunger, and global warming. Many people ask, “what happens to all the shoes?” The shoes are sold in major metro areas to vendors who in turn create jobs and help improve the quality of life in cities. The vast majority of Africans cannot afford new shoes. The proceeds from the sale of the shoes provides training and tools to the poorest rural farmers. 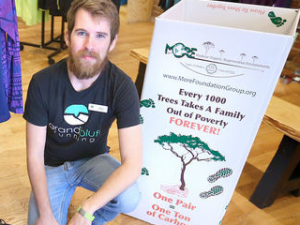 In addition to funding several life-changing efforts, collecting used shoes and selling them to locals in Ghana provides additional environmental benefits. So many shoes sit in dark closets, forgotten and never worn, and then end up in landfills. Reusing these shoes further promotes the global efforts to reuse and recycle. Drop off your gently used running shoes to Fleet Feet Madison or Fleet Feet Sun Prairie during regular business hours. In addition to the More foundation donations, we also donate locally to the Salvation Army and the Community Action Coalition. When the local options have enough shoes we then send the full boxes of shoes to the Moore foundation. Gently Used Athletic Shoes only Please! We can only accept athletic shoes that you would feel comfortable giving to someone else to wear. Unfortunately the shoe recycling programs that we partnered with in the past are no longer operating, so we are now forced to throw out unwearable shoes. We are looking for new options for recycling. If you have any ideas please email Matt A.